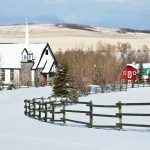 The Okotoks Safety Codes Department handles 2,000 permits for infrastructure such as plumbing, gas, electrical, building heating and ventilation annually. With the town’s population growing rapidly, permit applications are steadily increasing. Here is how we use Laserfiche to reduce permit processing time while complying with municipal and national records archiving standards—despite a four-fold increase in permit applications. Applicants had to make multiple visits to the department in order to submit materials and pick up finalized permits. When applications for permits increased, we found it difficult to approve them all within the two-week timeframe mandated by the province. 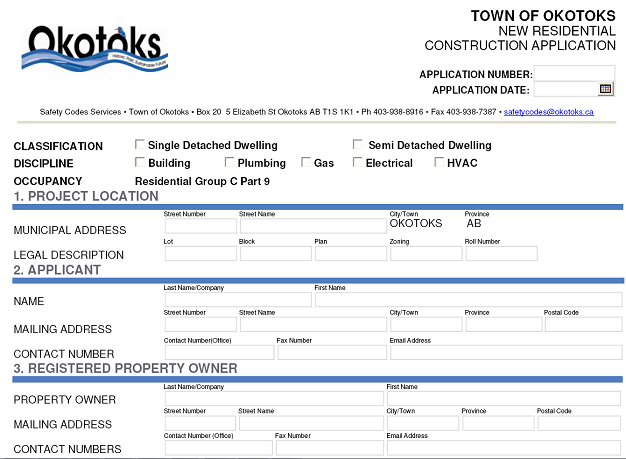 The permit applicant downloads the appropriate permit application (a fillable PDF form) from the Okotoks Building and Construction Permits Website. After filling out the form, the applicant submits it to the Safety Codes Department as an e-mail attachment. 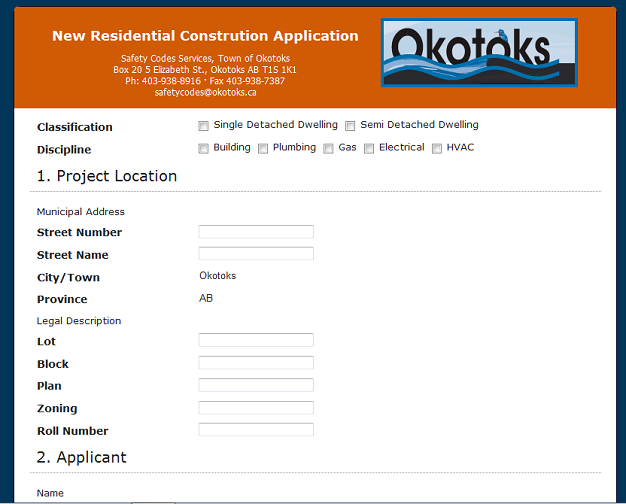 Any supplemental information that needs to be included with this application, such as architectural drawings or blueprints, can be either e-mailed as an attachment or submitted in hard copy to the Safety Codes Department. The Safety Codes Department reviews the application and any supplemental information that has been submitted. If there have been changes to the project before the permit is approved, a new application must be submitted with the changes. During the review process, the legal information including the building address is verified in our Microsoft Dynamics CRM. After the permit for construction has been approved, the entire application and supplemental documents (including the actual permit) are scanned into Laserfiche using Laserfiche Scanning. These files are all stored in one records folder in the Laserfiche repository based on the plan, block and lot number associated with the permit. 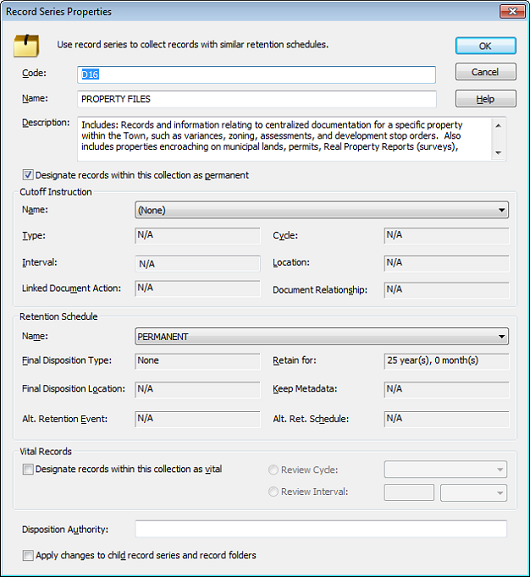 The appropriate records retention is then automatically applied to any document within a particular record series. Different record series have different retention requirements. 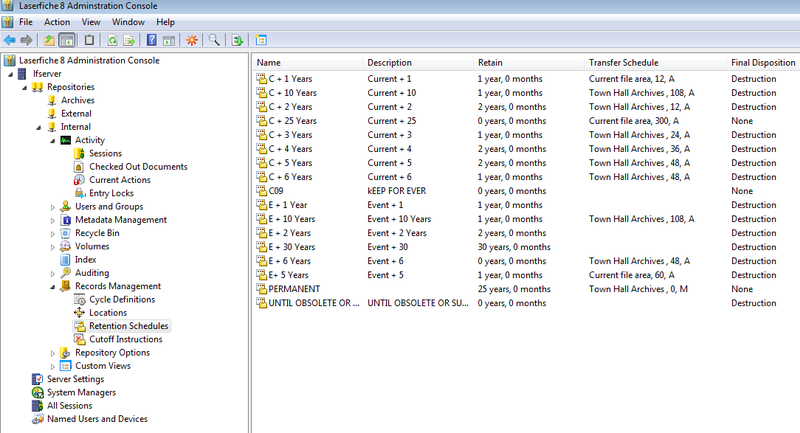 All of these retention rules are specified in the Laserfiche Administration Console. 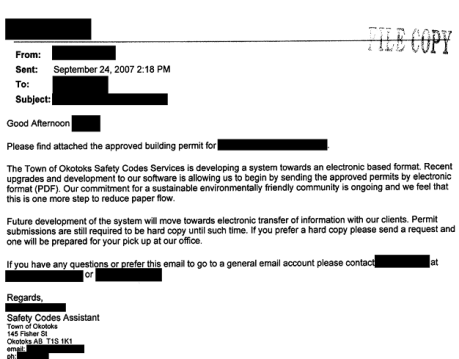 The final step in the permitting process involves sending the electronic version of the permit to the applicant as an e-mail attachment. Instead of applicants filling out a PDF form and e-mailing it to the Safety Codes Department, we plan on using Laserfiche Forms, a new e-forms product scheduled for release toward the middle of 2012, to create an electronic form that applicants will be able to fill out and submit online. Once the form is submitted, Laserfiche Workflow will route the form and supplemental information to the required storage area in Laserfiche where employees would review the documents before approving the permit. 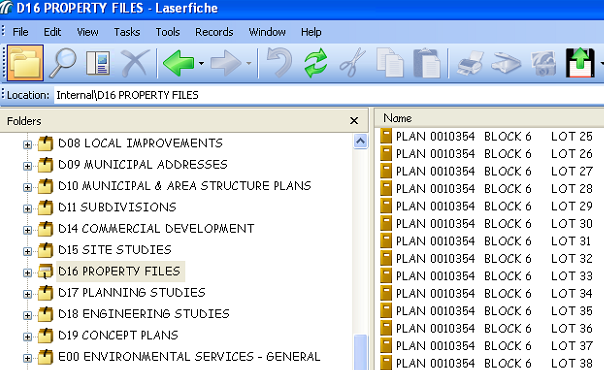 Employees would also use Laserfiche Web Access to access these files in Laserfiche without needing to have the program installed directly on their computers. Increase customer satisfaction by reducing both traffic to the front counter and printing/copying requests. Consistently meet the two-week permit approval turnaround time. Save one week of staff time per month on information management, allowing staff members to expand their roles. Improve information sharing between departments. Eliminate the need for third-party applications such as plan drawing software, since the actual plans can now be easily scanned and viewed in Laserfiche.